Peanuts and hummus? Might sound like a strange combination, but it’s actually a match made in flavor heaven. 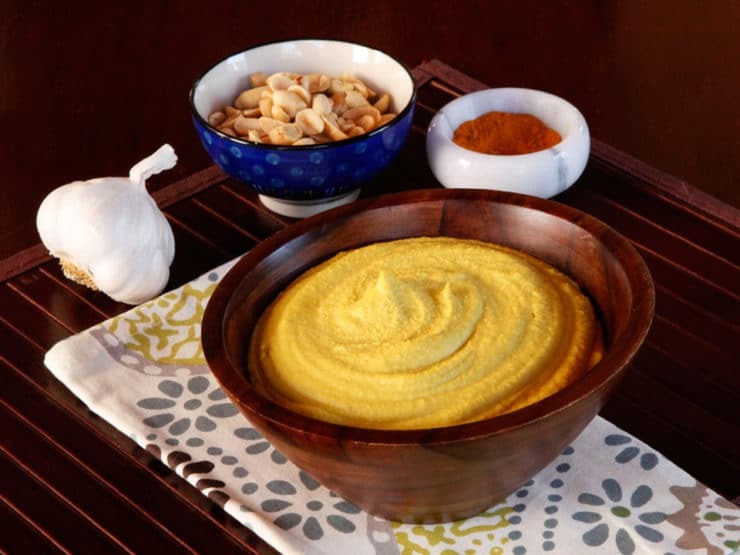 Peanuts and hummus both go waaaaay back… they’ve got history, lots and lots of tasty history. Peanuts in particular have a pretty interesting backstory. The peanut plant is believed to have originated in Brazil or Peru, though the only physical evidence we have are pots made in the shape of peanuts and peanut-decorated jars that date back 3,500 years ago. In 1500 BC, Incans from Peru entombed peanuts with mummies to help with their spirit life. Brazilian tribes also drank a beverage made from maize and ground peanuts. By the 1800s, peanuts were being grown commercially in the US and were used for oil, as a cocoa substitute and to feed livestock. During the Civil War, both armies looked to peanuts for their high protein value. Peanut butter may have been a result of a St. Louis physician’s need to supply his older patients with a protein-packed food source that didn’t require difficult chewing; it was formally introduced as a health food during the St. Louis World’s Fair in 1904. Both peanuts and peanut butter were an important part of army rations during World Wars I and II, with peanut butter and jelly being a favorite during World War II. Peanuts have served as a good luck token for NASA since the launch of the Ranger 7 on July 28, 1964. The goal of the Ranger program was to obtain close-up shots of the moon. Each attempt failed until Ranger 7 came along, armed with a jar of “Good Luck Peanuts” in the control room. The tradition has continued since, with peanuts making an appearance at NASA launches and in control facilities. That brings us to today, and my kitchen, where I recently combined roasted unsalted peanuts and chickpeas to create a new kind of hummus. I’d heard of folks replacing tahini with peanut butter before, but I’d never tried the combination myself. Knowing peanut butter often has added sugar and salt, I decided to use roasted unsalted peanuts so I could control the flavor more. It’s all being ground together anyway, right? I added some ingredients from my Classic Hummus recipe, then threw in some turmeric to warm up the flavor a bit. Turmeric has some pretty terrific health benefits, and it added a lot of oomph to the finished product. Final verdict? Peanuts and hummus really ARE a match made in heaven. Try it yourself and see! Just make sure you don’t serve this to anybody with a peanut allergy… it should be clearly labeled if you’re putting it on a buffet table around people you don’t know very well. Better safe than sorry! 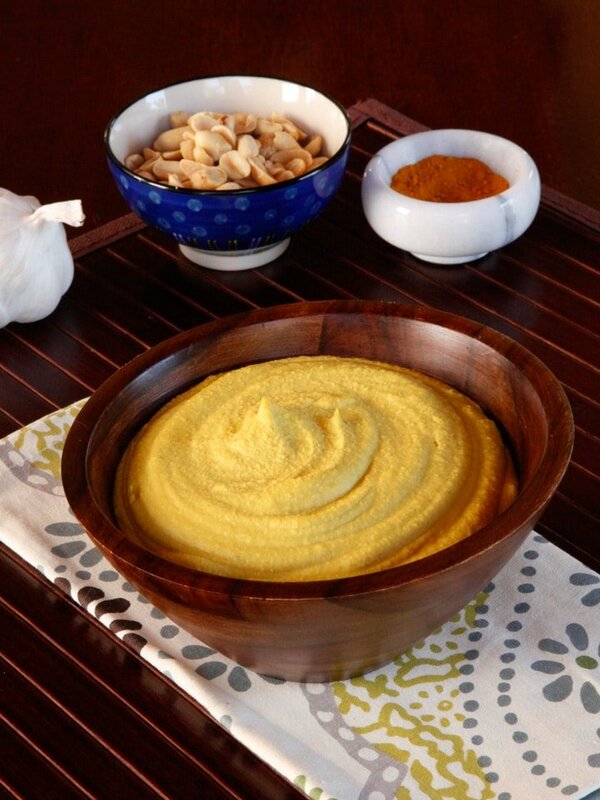 A unique and delicious spin on traditional chickpea hummus with garlic, spices, lemon and turmeric. 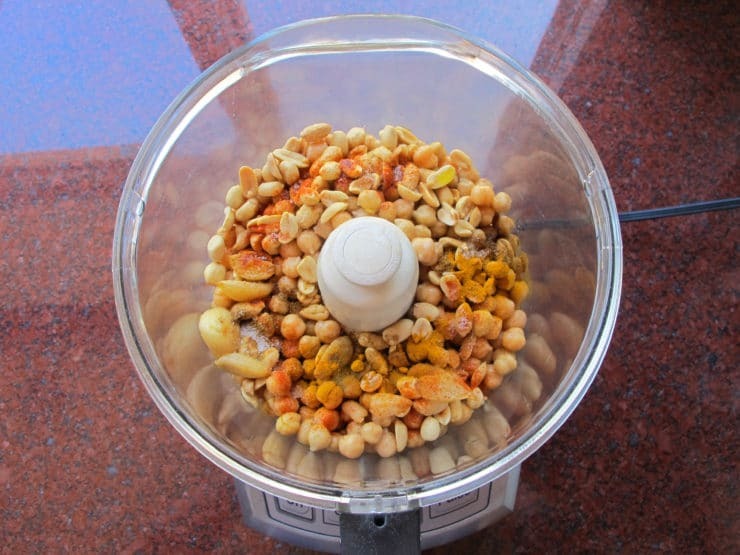 Combine all ingredients in a food processor. Pulse the ingredients for about 60 seconds, then process until smooth. Taste the mixture and add more salt or lemon juice to taste, blend again. If the texture seems too thick, add some of the reserved water from the cooking liquid or chickpea can. Continue to process until desired consistency is reached. Serve with warm pita, crackers or crudites for dipping. Note: for a smoother, fluffier hummus, you can peel the chickpeas before you begin. Take careful note not to serve this to anybody with a peanut allergy; it looks like regular hummus and could easily be mistaken, so label accordingly! “History of Peanuts & Peanut Butter.” National Peanut Board History of Peanuts. National Peanut Board, n.d. Web. 04 Aug. 2014. Muirhead, Brian, Judith Reeves-Stevens, and Garfield Reeves-Stevens. Going to Mars: The Stories of the People behind NASA’s Mars Missions Past, Present and Future. New York: Pocket, 2004. Print. Smith, Andrew F. Peanuts: The Illustrious History of the Goober Pea. Urbana: U of Illinois, 2002. Print. BTW Tori, phenomenal website!!!! I was linked to it by inspiredtaste.net, where I was looking for a tahini sauce recipe. I know this is an older recipe, but I just made this again and it is delicious. I also like how much easier it is on my checkbook! This has become a new family favorite. We make it, wash up some veggies and we sit around the table and chow down on hummus 🙂 Thanks Tori! Tori… roughly how many servings? I know that actually depends on how it is eaten … dip, spread etc.. but I’d like to know how much in general – for a group buffet. I would say about 8 appetizer-sized portions for a buffet. 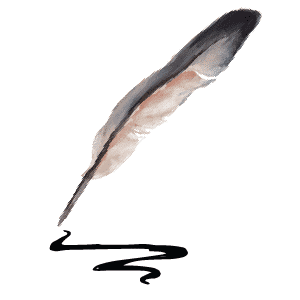 Hi Tori, I just found your website and actually being amazed by its variety. I’m a vegetarian and also currently on my low-carb diet. I love this recipe and I would definitely try it next time! If possible, would you please estimate how many calories does one meal like this contain? Cause you know, counting calories is perhaps the most important step in my losing weight process. Hi Darlene, I cannot provide nutritional information on my recipes at the moment, but there are several online calculators that you can use to determine the nutritional value for you. I will keep it in mind for the future. Fantastic recipe to try! I use a lot of hummus as I oft use it as a sandwich/toast spread on my open European sandwiches instead of butter. Make it about the same way as you but have never thought of adding peanuts . . . have no food allergies, so all-clear!! Methinks the nuts would add demonstrably to the taste of the finished product . . . so next time at the supermarket 🙂 ! I am allergic to sesame seeds, so I usually use almond or cashew butter for my hummus. I will have to try this with the peanuts and turmeric. Thanks for the twist. LOVE this. What a fun and unique recipe!! Cannot wait to try. Peanut humus? Why have I never heard of this ? ?? Hummus? LOL I thought that was a big bowl of POLENTA! Here in sc, you see places selling hot boiled peanuts in the shell, so good. Unique taste, kind of like green beans. Addicting. Thanks for sharing Tori, with peanut, cumin they give a better aroma and turmeric gives a better colour and it is anti Cancer too. I wonder why so many westerners are having food allergy ? This is not common amount the Asians. Is it you all love to drink Coke or soft drinks from young as I saw many parent bought Coke for kids even below 3 everywhere, even in the park. And on top of that too many parent love to use canned food. Yes, it is very easy, just open the can and eat or make into any dishes they like. I saw from a Taiwan Health program that all the cans have a coat even the drinks in the can that is very harmful. Who knows where they put these cans but many times I saw cartons of Vitagen, soft drinks or canned food under the hot sun or in the trucks waiting to be loaded to the shop or supermarket. Containers parked out side of the supermarket for 1 day under the hot sun. A host said that once he went to host a program and they gave him bottles of drinks, he was thinking ” Oh, new flavor as it tastes like Ginseng in the drink. When he asked after the program that it was just plain water as all the bottles were in the truck since yesterday afternoon until they removed them that morning. Bottlles and cans can’t stand heat, so we must be very careful. Have to try that one! I’ve been making boiled peanut hummus at work and everyone loves it. I made humus using dried chick oeas I soaked overnight then boiled then in salt water. I toasted sesames seeds in dry skillet grind into paste. But did one thing wrong put raw garlic clives as I pureed it! It gave a sharp strong taste! I should of roasted the garlic or used powder. If it wasn’t strong from garlic it tasted fresh with out all those perservatives, do you have a recipe for fresh pita bread? Does it need yeast.? Or any other nut! I am allergic to peanuts so I will try this savory dip with almonds or other nuts. Toda Tory, That is very helpful. Lynn Dorit- I had not thought of that. Sounds delicious. Thanks. Wow! Very interesting history and I love the mix of everything…especially turmeric and cayenne and cumin. Peanuts are on my list for my Saturday shopping and I will be making this. Sounds interesting with the cumin and tumeric. I might have to try this out! What would You serve with this? Last week I made a roasted eggplant hummus with cucumber slices. Nancy it would go great with warm pita or lavosh bread, carrot sticks, jicama sticks, added to a veggie wrap, with pretzels… there are lots of possibilities. Personally I’ve been eating it by the spoonful because it’s just so good! Never mine all that, just dip your finger in it ! In addition to using it as a dip, we use hummus on sandwiches instead of other condiments. Amber, great idea. We have a lot of power outages here in Nepal, where I live, so I am a bit shy of mayo. I think this will be a great option. I just stumbled across this site again after a long time. I’m loving your recipes because you don’t have so many pre-packaged ingredients that are impossible to get outside the US.